How do you know it’s faux fur? Yes to a hat for Charles for every outdoor occasion! I love all fluffy winter hats, and this one of Camilla’s works so well. I just wish it was styled in a more modern, and less bitty and fussy manner. There is so much going on in this outfit, so much texture and detail. The white scarf and cream blouse are summery, and do not relate to anything else in the outfit; and I see the same tendency with the neckline in each previous outing. Time for a new approach! An easy swapping of the pale scarf for a dark brown scarf to pick up the colour of her brown boots, would both simplify this outfit, and give it some real punch. I like this hat better in tan than in black. And I love her coat. So yummy. I second the motion to get Charles a fedora or other winter hat! His head must be cold! Shannon, Charles has a beautiful felt hat that he has wore down under. I can’t imagine that his comb-over keeps much heat in. November 5, 2012; Longreach, Queensland, Australia. Maybe we should start a petition to make Prince Charles wear a hat. The Duchess of C.’s hat looks very comfy and easy to wear and the faux fur is flattering to the face. But I find the coat rather peculiar! Nice fabric, but bad fit, with to much in-build bosom, if you don’t mind my mentioning it. Maybe one has to be British to appreciate? Re the coat: I thought so too, Wies. I’m guessing that the Duchess’s figure is changing over time (as everyone’s does in their senior years)– so this coat does not fit her as perfectly now as it did in the 2014 Previously Worn linked pic. I don’t think it’s a weight change –in all probability, Camilla has lost some height in her upper thoracic area, causing the coat to drop and sit too low at her waist. A slight increase in curvature of the spine will also affect the bust position, and therefore the fit. It will never be my favorite hat for Camilla, but it’s one she’s worn well and certainly is getting her money’s worth out of it. A good look for a more casual day at the races. But we should really get Charles in a fedora; something in grey would’ve tied in nicely with his grey suit. 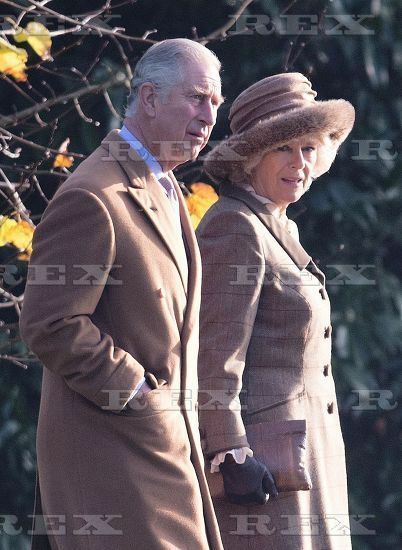 A lovely winter ensemble for the Duchess of Cornwall. I believe she has this hat in several other colors, but this hat and coordinating coat, scarf and boots are so harmonious together. LOVE the handbag with the punch of color.